The summer holidays are in full swing over here at Magpie Towers and we have been getting out and about as much as we can. Over the last week we haven't managed to get to the beach, but tomorrow's forecast is looking good so we will be getting out the buckets and spades once again. As well as the picnics, we have been crabbing, swimming, walking, playing at the park (well, several parks) exploring a model town and having a few adventures. Examining the catch, the final tally was 7! The littlest Magpie wanted to take this cutie home. That's me - I did the monkey bars!! My Hitchhiker#2 has been living in my handbag so that it can be whipped out at any available opportunity while the boys are otherwise occupied and has been growing steadily. The missing Hitchhiker#1 got to 45 teeth and I think that the yarn ball looked slightly smaller than this one. I'm on tooth 30 now, so still a way to go but I am proud to say that there are still no mistakes in this one and I aim to keep it that way! I have also been adding the odd new stripe to my Granny blanket when I get settled enough of an evening. 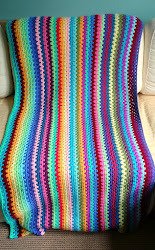 This picture shows 20 more stripes than when I last blogged about the blanket here. Because we have been using the blanket so much already I have changed my mind about making this double-bed sized because I think that if I do it will get left on a bed and would be too big to be carried around by the kids or to be a useful size. I have just completed stripe 55 and think that I will probably continue to a nice round 60 before moving on to the border. Granny Magpie has been making her very own Granny Stripe, her first crochet project and I can't wait to see it. A good friend of mine who asked me to show her how to crochet has also been making her own blanket so hopefully soon I can show you pictures of three finished masterpieces! This weekend we will be having a visit from Grandad, who will be taking the middle-sized Magpie back up to the Midlands to spend a week with Granny Magpie. After a relatively quiet week we will be visited by the Magpie cousins and are looking forward to all the Magpies enjoying some holiday time together as Mr Magpie will be off work too.